Maung Weik—who was until recently a favorite business crony of Burma’s generals—has been sentenced at Lanmadaw Township Court in Rangoon to 15 years imprisonment on drug trafficking charges, according to a member of his staff and sources in Rangoon. Maung Weik, 35, the founder member of the Maung Weik & Family business group, was previously involved in international trade and real estate, but in recent years had allegedly begun importing chemical-based stimulants, such as Ecstasy and Ketamine, to Burma, which he then offered or sold to his peers—wealthy young socialites and sons of the generals. According to members of the Rangoon business community, Maung Weik was taken in for interrogation in late May by police, in relation to his involvement in a case concerning Aung Zaw Ye Myint, one of a top general's sons. "Maung Weik and Aung Zaw Ye Myint used drugs together and sold them to movie stars and young socialites,” said a former business partner of Maung Weik. A Rangoon police source said that Burmese special forces raided Aung Zaw Ye Myint’s office at Yetagun Tower in Rangoon on May 29 and founded illegal drugs and six guns. In early July—along with alleged associates Nay Tun Lwin, Aung Min, Kyaw Phone Naing, Kyaw Hlaing, Kyaw Kyaw Win and Malaysian national Peter Too Huat Haw—Maung Weik was charged with drug trafficking. According to a source, Aung Zaw Ye Myint—the son of Ret Lt-Gen Ye Myint, the former chief of the Bureau of Special Operation (BSO No.1)—was soon after brought to No.66 Light Infantry Division in Innma, Pegu Division, but was released without charge. To date, Aung Zaw Ye Myint has not been charged with any offence. Maung Weik is known as a generous donor to projects sponsored by the Burmese junta, once giving 270 million kyat (nearly US $235,000) for restoration work on Shwedagon Pagoda, Burma’s most famous religious site. 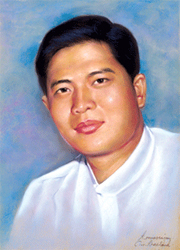 In recent years, Maung Waik was seen as attempting to strengthen his ties to the regime through marriage. According to a relative of junta chief Snr-Gen Than Shwe, Maung Waik began courting the general’s daughter, Khin Pyone Shwe. According to members of Rangoon’s business community, Maung Weik divorced his wife, Yin Min Thee, in the hope of marrying Than Shwe’s daughter. However, alarm bells went off instead of wedding bells when Maung Waik was arrested in late May. His mother and ex-wife fled to Singapore, although they have since returned to Rangoon.